“Because of their sheer scale, all Canadians are affected by the Tar Sands, no matter where they live. If you live downstream, your water is being polluted and your fish and wildlife may be dangerous to eat. If you live in Saskatchewan you are a victim of acid rain. If you live in BC, “supertankers” may soon be plying your shoreline carrying Tar Sands oil to Asia. If you live in Ontario, you are exposed to harmful emissions from the refining of Tar Sands Oil. And the impacts do not stop at Canada’s border – US refineries are re-tooling to handle the dirty oil from Alberta. This entry was posted on June 15, 2008 at 3:40 am	and is filed under Uncategorized. 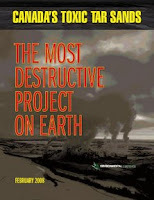 Tagged: acid rain, alberta government, most destructive project, oil sands, stelmach, supertankers, tar sands. You can follow any responses to this entry through the RSS 2.0 feed. You can leave a response, or trackback from your own site.